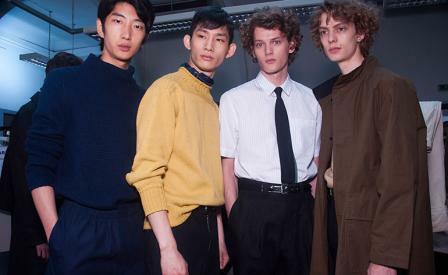 Mood board: Margaret Howell’s spring show also tuned into an aviation vibe, opening with a series of navy looks that had a 1970s American Airways pilot spirit. Pants came cropped and cuffed, while Irish linen shirts were worn short-sleeved and smartened up with knitted two-tone ties. Shorts were another mainstay, and were teamed back with cardigans and white vests, all of which were tucked in with military precision. Scene setting: Howell nearly always shows her collections within her white-washed Wigmore Street store space, so the soundtrack is elemental in setting the scene. This season music collaborator Paul Thomas sampled a softer, female vocalist version of the Eagles’ Hotel California, which cemented the presentation’s relaxed, West Coast feel. Team work: When you unpack a Howell collection you are left with a lot of her signature pieces in new hues and materials. Enter stylist Beat Bolliger who remixed a fresh retro vibe for the separates based collection. Belts are always key to the mix at a Margaret Howell show, but there was an awful lot of tucking in this season – chunky knitted vests and cardigans included. At street level, the season’s boxer shorts and ankle-cropped pants also reinforced Bolliger’s somewhat controversial white leather lace-ups and dark sock pairing.